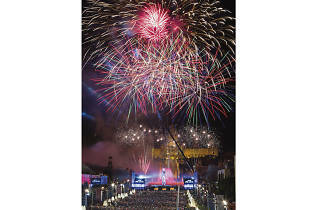 Barcelona city council has upped the ante recently on the local end-of-year festivities, to compete with the established New Year celebrations of Edinburgh, London and New York. For last year’s inaugural event, Plaça Espanya hosted a big outdoor party that included human towers and a huge firework display. The star of the evening, though, was a 15m-tall human figure in front of the Magic Fountains in Montjuïc, part of a family-friendly show produced by theatre group Fura dels Baus, using water, lights and pyrotechnics to create a memorable welcome to the year. If you really want to get into the party mood, local tradition dictates the wearing of red underwear and eating 12 grapes at midnight, finishing them before the last bell stroke. Seedless grapes may help with a task that’s much more difficult than it sounds.